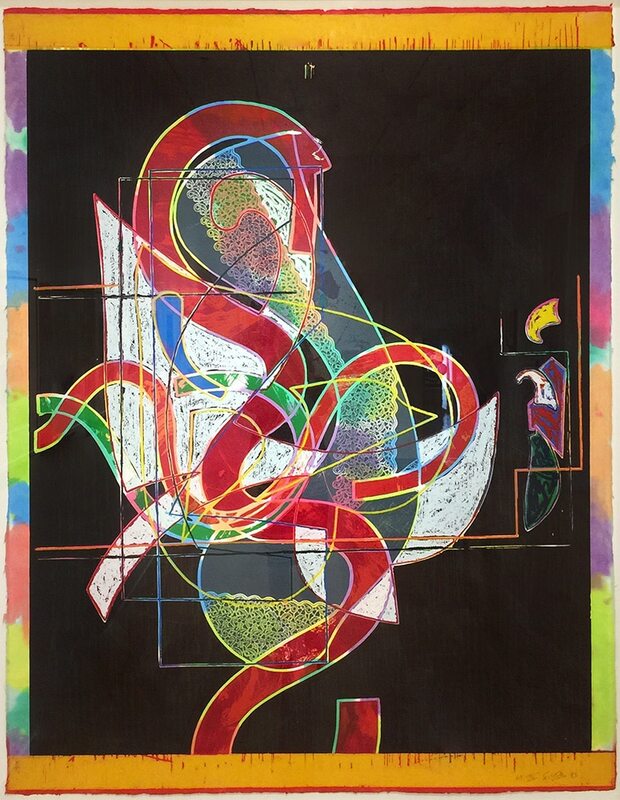 Frank Stella (born 1936) is an American painter, sculptor, and printmaker. As a founding figure of the Minimalism and Color Field movements, Stella is recognized for his sharp departure from Abstract Expressionism. Stella’s nonrepresentational paintings allow the essential elements of his artistic practice—such as line, volume, and plane—to dominate the composition. Well known for his so-called “Black Paintings,” Stella’s innovative early work served as an important predecessor to the industrial and geometric starkness of Minimalism in the 1960s. However, after 1965 Stella broke with the stark demands of that style and embarked on a path toward more elaborate or “baroque” works known as “Maximalism.” This exploration dominated Stella’s practice during the 1980s and 1990s. During which time, Stella produced works that incorporate rich color and extrapolate in three dimensions that which he had mastered in two. Frank Stella was born in Massachusetts in 1936. He attended high school at Phillips Academy and continued his education at Princeton University, studying history. By 1958 he moved to New York City, earning a living as a house painter. However, he quickly took the art world by storm. Before the age of 25, Stella had already been recognized for his unique style and avant-garde approach. His “Black Paintings,” an early series, attracted attention as a departure from the dominant style of Abstract Expressionism. In 1961 he married Barbara Rose who would become a well-known art critic. In addition to his support of other radical modernists shown in his gallery, Leo Castelli was a key promoter of Stella’s work through the 1960s. During that decade, Stella also explored complex printmaking and set design. The Museum of Modern Art, New York held a retrospective for Stella in 1970. The show subsequently traveled to the Tate Gallery, London and the Stedelijk Museum, Amsterdam. Throughout the 1970s and 1980s Stella’s work became more vibrant and intricate. 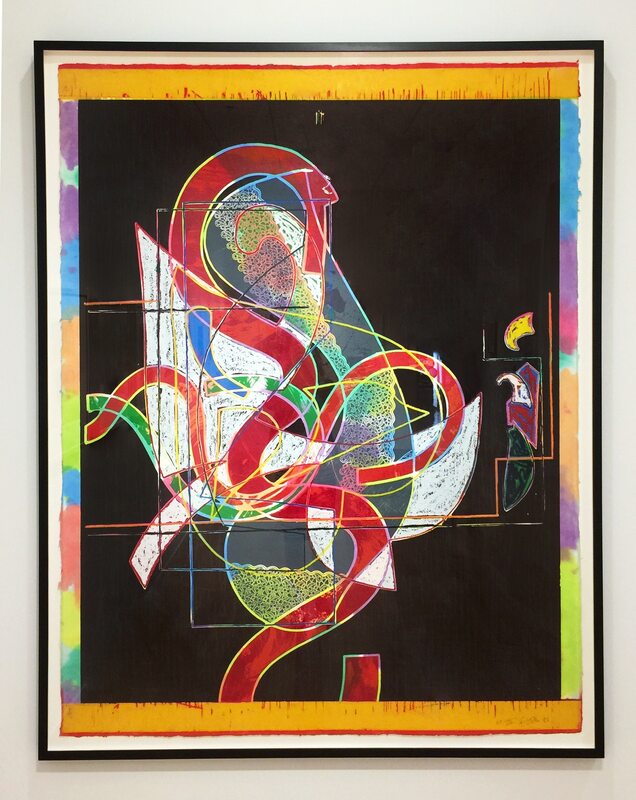 The idea of relief found its way into Stella’s work, developing into the so-called “Maximalist” works, which began to combine painting with a sculptural structure. This exploration eventually led to even greater depth in his works during the 1990s. Stella ultimately created large-scale freestanding sculptures, assisted by a combination of hand tools and digital technology. These sculptures were often placed in public spaces including the National Gallery of Art in Washington, D.C.
Stella’s impressive oeuvre has earned a vast array of awards and accolades. In 1981 Stella was awarded the Skowhegan Medal for Painting. In 1982 he won the Mayor of New York Award of Honor. In 1984 he received an honorary Doctor of Arts degree from Princeton University. The following year he was recognized with the Award of American Art from the Pennsylvania Academy of Fine Arts. Also in 1985, Stella was awarded an honorary degree from Dartmouth College. In 1992, he won the Barnard Medal of Distinction, and, in 1998 he received the Gold Medal for Graphic Art from the American Academy of Arts and Letters. Most recently, Stella received the 2009 Medal of Arts from President Barack Obama. Stella lives and works in New York City. 2013 – “Over, Under, Next: Experiments in Mixed Media, 1913–present,” Hirshhorn Museum and Sculpture Garden, Washington, D.C.
2001 – “Prince of Homburg,” Installation on the lawn of the National Gallery, Washington D.C.